The global head of Greenpeace has been arrested after scaling an Arctic rig operated by oil firm Cairn Energy. International executive director Kumi Naidoo was arrested along with another campaigner after boarding the Leiv Eiriksson rig off Greenland. The arrests followed an injunction issued last week by a Dutch court, barring Greenpeace activists from approaching the drilling vessel. Cairn Energy won the injunction after several similar occupations. Under the terms of the court order, Greenpeace faces a penalty of 50,000 euros (£44,370) a day, up to a maximum of 1m euros, for failing to comply. Edinburgh-based Cairn confirmed members of the environmental group had boarded the Leiv Eiriksson but had been removed by the Greenland authorities without interrupting the operation of the platform. In a statement, the company said: "Wherever it is active, Cairn seeks to operate in a safe and prudent manner. "The Greenland Bureau of Minerals and Petroleum has established some of the most stringent operating regulations anywhere globally, which mirror those applied in the Norwegian North Sea." Greenpeace said Mr Naidoo travelled to the Leiv Eiriksson vessel on an inflatable speedboat launched from the group's ship Esperanza, evading a Danish navy warship. He then climbed a 30m (98.4ft) ladder up the outside of one of the platform's legs. Mr Naidoo carried the signatures of 50,000 supporters who have called for Cairn to explain how it would deal with a deep water drilling disaster similar to that which hit BP's Deepwater Horizon rig in the Gulf of Mexico a year ago. Greenpeace claims Cairn Energy have refused repeated requests to publish its oil spill plan. Speaking before he set out to scale the platform, Mr Naidoo, said: "The Arctic oil rush is such a serious threat to the climate and to this beautiful fragile environment that I felt Greenpeace had no choice to return, so I volunteered to do it myself." Ben Stewart, a Greenpeace associate onboard the Esperanza, said after Mr Naidoo's arrest that the activists were heading out of the area, although the battle to stop Arctic oil drilling was "far from over". He said: "After over a month of non-stop action to stop dangerous deep water drilling in the Arctic, which has seen 22 Greenpeace activists, including Kumi, arrested after braving freezing seas to protest against Cairn's reckless drilling, it is time to move the campaign up a gear and out of the Arctic. "We are now leaving the area and taking the campaign against dangerous Arctic oil drilling to other places, and that's where we'll be for the rest of the year." Protesters trying to delay drilling operations, which must take place during the region's short summer, have twice before boarded the Leiv Eiriksson in recent weeks. 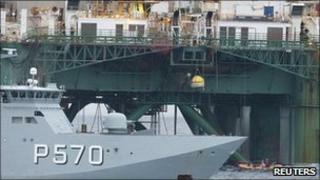 In one incident, work was suspended for 12 hours after 18 Greenpeace protesters breached a restricted area on the rig. Cairn, through its subsidiary Capricorn, operates 11 blocks off Greenland and plans to drill up to four wells off Greenland in summer 2011.